The SilverFast All-in-One devices are now available in the entire EU! for scanning and archiving your analog image originals. Regardless of event—whether vacations, weddings, birthdays, concerts etc.– photos and slides commonly play an important role in preserving our most cherished memories. These old images are treasure troves of the past and it is our job to preserve them because once they are gone, they are gone forever. Contrary to popular belief, even images stored in ideal storage conditions will not last forever. Over time, colors and materials inevitably decay and corrode and these witnesses of times-passed disintegrate and disappear. Whether you want to scan slides, photos, negatives or film strips, with the entry-level model Epson Perfection V600 Photo with SilverFast SE Plus 8 these tasks are no match for you. The new professional scanner devices from Epson - the Perfection V850 Pro and the Expression 12000XL - together with the award-winning SilverFast Archive Suite 8 is the perfect combination of up-to-date hardware and software for digitizing your photographic media. This compelling Epson packages also include a SilverFast IT8 Target Set (acording to ISO standard 12641-1) for automatic scanner calibration, a Resolution Target for measuring the actual resolution capabilities of your scanner, and additional accessories. 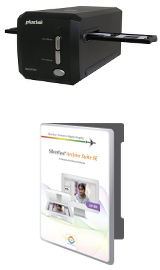 As slide and negative scanner, the Plustek OpticFilm 8200i is available in two different packages. We offer the classic small image scanne OpticFilm 8200i together with our Archive Suite or the Archive Suite SE. Featuring an exclusive archiving workflow, both the Archive Suite and the "smaller" Archive Suite SE enable processing entire image series. This means significantly more comfort and speed compared to the standard scanner packages with SE Plus and Ai Studio. With the Reflecta MF5000 we offer a scanner for medium formats, which of cause also digitizes 35mm slides and filmstrips. 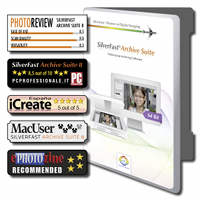 Compared to the standard scope of delivery, this package is enhanced by the SilverFast Archive Suite. 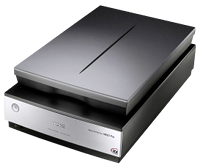 Its RAW data concept is ideally suited for high-quality scanning and archiving with the MF5000. Switch to the perfect All-in-One combination now! Among our SilverFast All-in-One packages there will be definitely the right package for you. You need a scanner for digitizing medical x-ray film? Please click here. In combination with scanner software SilverFast SE Plus 8, the Epson Perfection V600 Photo provides an amazing amount of functionality. This flatbed scanner with an integrated transparency unit digitizes documents and photos, but also slides, negatives and film strips. Featuring many intelligent automatics for frame-finding and image optimization, SilverFast allows even beginners to achieve high-quality scan results. Featuring Epson ReadyScan LED technology, you can start scanning instantly with no warm-up time and whatever you scan you can be sure of capturing every detail with high-quality 6400 dpi optical resolution with Epson Matrix CCD® technology. The Plustek OpticFilm 8200i scans 35mm slides and negatives with a resolution of up to 7200 dpi. The optical systems, the LED technology and the combination with the included SilverFast Archive Suite 8 PREMIUM software make this film scanner ideal for demanding photographers with professional requirements. Calibrating the scanner using the included IT8 target enables to create an excellent digital image archive. The Plustek OpticFilm 8200i is a 7200 dpi resolution scanner for 35mm slides and negatives. Its state of the art illumination and optical systems are designed to resolve very small differences in edge contrast. 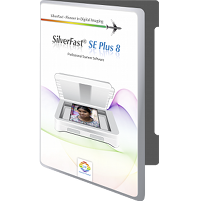 The included SilverFast Archive Suite SE 8 software offers all functionality needed for high-quality scanning and BASIC image optimization. With the DigitDia 7000 from Reflecta you can scan your 35mm slides in record time. The DigitDia automatically digitizes one slide after the other from the inserted slide magazine. The high optical resolution of the device and the built-in infrared technology in combination with the powerful SilverFast software guarantee excellent results. The newest advanced IT8 Targets for scanner calibration are already included in the package. The MF 5000 is a medium format scanner, which scans 35 mm slides and filmstrips as wel as 20/220 mm, 6x4.5 cm, 6x6 cm, 6x7 cm, 6x8 cm, 6x9 and 6x12 cm (positive and negative). On its website, the manufacturer Reflecta expressly recommends to use the MF 5000 in combination with SilverFast scanner software in order to further increase this device‘s efficiency.